Olympian Labs Agmatine Sulfate is a dietary supplement that provides the organism with agmatine sulphate, an arginine derivative that serves as a signalling molecule in the body. Only negligible, practically insignificant amounts of it can be found in food, which means that in order to benefit from its activity, it must be supplemented from external sources. Additionally, because of its chemical structure, the native form of agmatine is assimilable only to a very small extent, while the form of its sulphate used in this product eliminates the problem. It increases endorphin secretion – because of quite significant affinity to the imidazoline receptor, it works as its activator. A greater amount of endorphins in the circulatory system has an analgesic effect and improves overall well-being. It also reduces blood pressure and enhances glucose metabolism in the organism. More glucose is absorbed by skeletal muscles, which additionally helps to increase their energy management. It regulates catecholamine levels – agmatine exhibits high affinity to alpha-2A-adrenergic receptors, which lets it regulate the level of catecholamines, mainly adrenaline, noradrenaline, and dopamine. It exhibits neuroprotective properties – agmatine binds with the NMDA receptor, blocking the negative process of excitotoxicity by limiting the signalling of harmful molecules (glutamate and NMDA). It has also been demonstrated to protect the brain from the toxins that have a negative effect on memory (the effect has been tested against the consequences of the activity of beta-amyloid, MPTP, and scopolamine). It supports serotonin circulation in the nervous system – it improves serotonin signalling between neurotransmitter receptors. At the same time, it works in synergy with serotonin-increasing substances. It exhibits analgesic properties – research shows that agmatine reduces the intensity of pain, mainly that induced by inflammation and neuropathy. A positive synergy has also been demonstrated between agmatine and cannabinergic analgesics, whose efficacy increased even 3-4 times when used with agmatine. It facilitates the process of substance withdrawal treatment – it has been demonstrated that agmatine can be a useful aid in addiction therapy. By modulating alpha-2A-adrenergic receptors in antinicotinic therapy, it reduces the craving for nicotine, an in the case of anti-alcohol therapy, it reduced the symptoms of substance withdrawal through its activity antagonist to NMDA receptors. It increases sensitivity to stimulants – its binding with NMDA receptors can also help to sensitise the organism to the activity of stimulants. Stimulants often increase the activity of the receptors, and their excessive use can increase the dosage needed to activate them (in other words, they reduce their sensitivity). Partially blocking NMDA receptors can, therefore, increase their sensitivity after regular supplementation. It protects from strokes and ischaemia – the activity has been demonstrated mainly by regulating the enzymes connected with nitrogen metabolism in the organism. 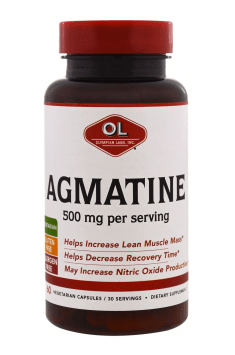 Agmatine reduces the activity of the enzyme that causes the overproduction of nitric oxide, which can lead to a stroke (iNOS), and exhibits protective properties regarding the enzyme eNOS, which reduces the risk by dilating blood vessels (vasodilation). It also reduces the risk of cell degradation caused by ischaemia or limited oxygen supply (by increasing the activity of NF-kB). It prevents stress and depression – the systemic concentration of agmatine is believed to be connected with the sensation of anxiety. Increasing its concentration with moderate doses (according to research, the dosage of 10 mg per kilogram of body weight is already effective, while the dosage of 80-100 mg/kg increases anxiety) exhibits great anxiolytic and antidepressant properties. It has a positive effect on cognitive functions – research demonstrates that agmatine can affect the formation of memory: during tasks connected with remembering, its increased flow was observed in the parts of the brain responsible for memory. It also increases the activity of cAMP, that is one of the most important neurotransmitters, in the prefrontal cortex, which is responsible for some cognitive functions. It can prevent epileptic episodes – epileptic seizures are preceded by excessive signalling of nitric oxide. Agmatine reduces the amount of nitric oxide in the process, that way reducing the risk of a seizure. It reduces the neurological symptoms of aging – with age, the organism develops dysfunctions in the functioning of the nitrogen-dependent system, mainly in terms of increased activity of the NOS enzymes in the prefrontal cortex. The administration of agmatine reduced the consequences of controlled nerve cell aging, which can serve as evidence of its factual ability to delay the occurrence of cognitive function deterioration as the body ages. It enhances the functioning of the circulatory system – agmatine induces the synthesis of nitric oxide, mainly by affecting the alpha-2A-adrenergic receptors. Please note that research reports that its receptor-activating potential is a hundred times (!) greater than that of arginine and citrulline. It has also been demonstrated to reduce internal bleeding by modulating blood pressure. The functioning of the kidneys – it increases the intensiveness of kidney filtration, which is the process that protects the kidneys from the excessive deposition of harmful substances. To sum up, Olympian Labs Agmatine Sulfate is an excellent choice for people whose main goal is to support their nervous systems. Agmatine has a wide range of positive effects on neurological functions. Additionally, it supports the circulatory system and overall health of the organism. The highly assimilable form of agmatine and the reputation of the producer are undoubtedly additional advantages of the preparation. Take two (2) capsules, once a day with a meal, or as directed by a healthcare professional. Agmatine is a fantastic nitrogen production modulator, a hundred times more efficient than citrulline and arginine. Because of that, it can also be interesting for you if your goal is increasing the effect of a muscle pump. Those properties make it a great companion for pre-workout products when used in the dosage of 500 mg (1 portion). Olympian Labs is one of the fastest-expanding international companies that produce supplements. Their products contain the purest materials that offer the best benefits possible. They are subjected to complex purity and strength tests in order to make sure that they comply with the highest standards. As years went by, Olympian Labs has become very well known in the industry of natural health thanks to their infallible devotion in the matters of quality, outstanding research, development, the vitamin area of sciences, and providing customers all over the world with unique specialist preparations. Vegetarian capsule (HPMC), ascorbyl palmitate, microcrystalline cellulose, silica, rice flour. The product has bactericidal and bacteriostatic effect; decreases susceptibility to infections.